If you missed the first parts to this series, here are the links: Amanuensis Monday: Not My Henry Bryant's Civil War Pension File --Part One, Amanuensis Monday: Not My Henry Bryant's Civil War Pension File --Part Two, Amanuensis Monday: Not My Henry Bryant's Civil War Pension File --Part Three. 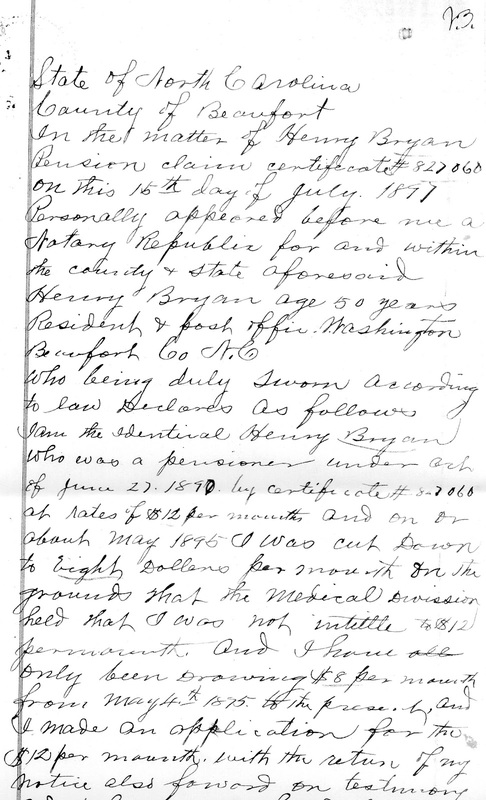 The purpose of these posts again is to share information about a Henry Bryan who's Civil War pension file I had originally purchased hoping it would show information regarding my 3rd great grandfather, Henry Bryant of Morehead City, NC. My 3rd great grandfather on the 1870 census resided in Beaufort, Carteret County, NC. It turns out that the Henry Bryan who's pension file I have actually resided in Beaufort County, NC and was single. Anyway, I thought the information that I came across could perhaps help someone someday who is searching for this particular individual who served in the 37th Regiment of the U.S.C.T. Vols.. In the matter of Henry Bryan Pension claim certificate# 827060 on this 15th day of July 1897. Personally appeared before me a Notary Republic for and within the county & state aforesaid Henry Bryan age 50 years Resident & post office Washington Beaufort Co N.C.
who being duly sworn according to law declares as follows I am the identical Henry Bryan who was a pensioner under act of June 27 1890 by certificate# 827060 at rates of $12 per month and on or about May 1895 I was cut down to eight dollars per month on the grounds that the medical division held that I was not intitile to $12 per month. And I have only been drawing $8 per month from May 4th 1895 to the present. 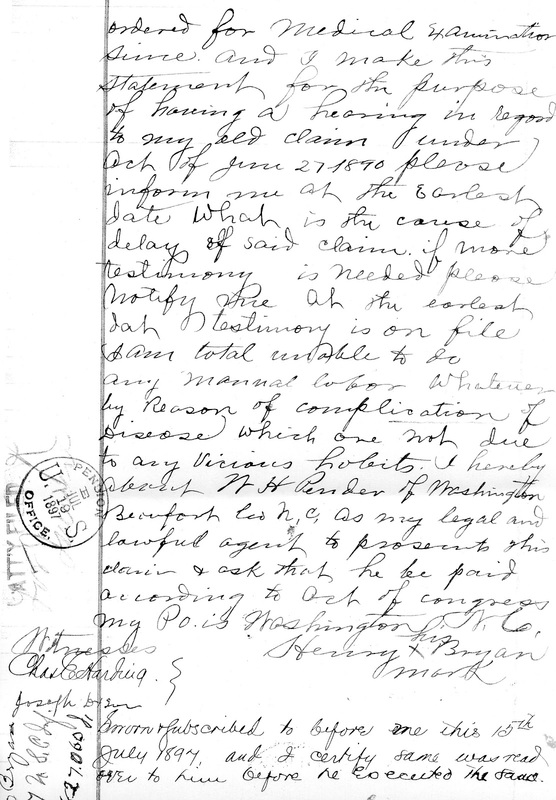 And I made an application for the $12 per month with the return of my notice also forward on testimony and I have not heard from same since & I have not been ordered for medical examination since and I make this statement for the purpose of having a hearing in regard to my old claim under act of June 27 1890 please inform me at the earliest date what is the cause of delay of said claim if more testimony is needed please notify me at the earliest date testimony is on file. I am unable to do any manual labor whatever by reason of complication of disease which one not due to any vicious habits. I hereby about W H Pender of Washington, Beaufort Co N.C. as my legal and lawful agent to prosents this claim & ask that he be paid according to act of congress My P O is Washington N. C.
Sworn subscribed to before one this 15th July 1897 and I certify same was read over to him before he executed the same. Some of those poor men had such difficulty getting and maintaining their pensions. All those letters back to back is what make their records so interesting. Linda, that is what I find so interesting and what breaks my heart. You can hear in the tone of the letter his dismay. I wish I could go back in time and smack someone upside their head and get him his money.